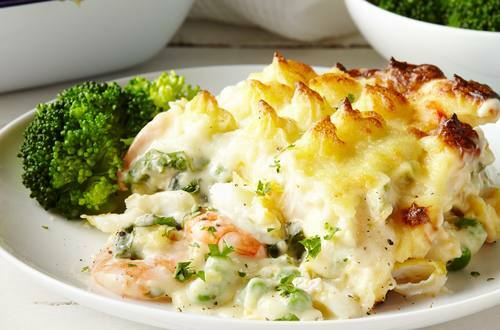 Haddock and shrimp are mixed with creamy Hellmann's® or Best Foods® Real Mayonnaise in this golden and bubbly fish pie recipe. 1 Preheat oven to 350°. Spray 3-quart baking dish with no-stick cooking spray; set aside. 2 Cover potatoes with water in 4-quart saucepot; bring to a boil over medium-high heat. Reduce heat and simmer 15 minutes or until potatoes are very tender; drain. Stir in 2 Tbsp. Hellmann's® or Best Foods® Real Mayonnaise and 1/2 cup milk. Mash potatoes, then set aside and keep warm. 3 Melt Country Crock® Spread in another 4-quart saucepot over medium heat and stir in flour with wire whisk until blended. Slowly stir in remaining 1-1/2 cups milk and bring just to the boiling point, stirring frequently. Stir in wine and heavy cream and cook, stirring frequently, until slightly thickened. Stir in cheese, mustard and remaining 2 Tbsp. Hellmann's® or Best Foods® Real Mayonnaise. Cook 5 minutes over low heat, stirring frequently, until cheese is melted. Stir in scallops, shrimp, fillets, spinach and peas. Cook, stirring occasionally, 3 minutes or until shrimp just start to turn pink. 4 Turn fish mixture into prepared baking dish. Pipe or spoon on warm mashed potatoes. 5 Bake 30 minutes or until bubbling and fish is cooked.